7 August 2017. A clinical trial is planned to test the benefits of managing type 2 diabetes with an inhaled formulation of insulin and a smartphone app. The study is the first joint initiative of Mannkind Corp. in Valencia, California, makers of the inhaled insulin, and One Drop in New York that develops digital diabetes management systems using mobile computing and data science. Mannkind makes medications formulated as a fine dry powder to be inhaled and delivered through the lungs. The company’s lead product is Afreeza, an inhaled form of insulin packaged with an inhaler, and approved by FDA for adults having either type 1 or type 2 diabetes. Mannkind says Afreeza is designed to be taken at meal time to control blood sugar levels, since it takes affect in 12 to 15 minutes. One Drop offers a diabetes management system with a glucose meter, lancing device, and test strips similar to other devices for measuring blood glucose levels. 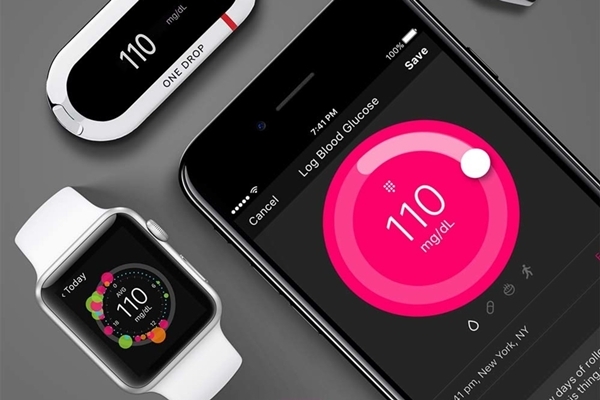 One Drop also offers a mobile app — available in iPhone, Android, and smart watch versions — that imports data from the company’s glucose meter, as well other digital glucose meters. In addition, the app reminds users to take medications, tracks medications taken, and monitors insulin pump basal rates, the ongoing minimal delivery of insulin to the blood stream. The app includes a built-in database of food that provides carb estimates and captures data from the phone’s built-in activity tracker or those from leading vendors. The clinical trial aims to test One Drop’s premium service — the glucose meter, mobile app, test strip subscription, and coaching service — among people with type 2 diabetes. All participants will use the One Drop system, but will be randomly assigned to receive Afreeza, or continue with the One Drop system alone. The study team will track among participants their blood glucose levels in terms of hemoglobin A1C, as well as quality of life indicators, self-care measures, and satisfaction with their treatment. The companies’ announcement did not indicate the number of participants in the study or its schedule. In May 2017, the two companies announced their collaboration to provide better access, convenience, and cost savings to people with diabetes, as well as provide more personalized coaching and engagement, and explore adding more technical capabilities to Mannkind’s inhaler, such as Bluetooth connectivity. In August 2014, Mannkind licensed Afreeza to global drug maker Sanofi for commercialization, but ended that license agreement in January 2016. As reported by Science & Enterprise in September 2016, Sanofi and Verily Life Sciences division of Alphabet — parent company of Google — announced a joint venture to develop health management solutions for people with diabetes.